Jonathan RENO was born on 30 Sep 1780 in Elizabethton, Carter, Tennessee. He died in Jan 1838 in Springfield, Greene, Missouri. Jonathan married Sarah ROGERS. Sarah ROGERS was born on 2 Mar 1785 in Fredericksburg, Spotsylvania, Virginia. She died on 17 Feb 1849 in Browning, Schuyler, Illinois. Sarah married Jonathan RENO. F i Mary "Polly Ann" RENO was born on 2 Jun 1806. She died on 19 Sep 1886. Jacob HOLLINGSWORTH [Parents] was born in 1775 in , Burke, North Carolina. He died in 1853 in , Madison, Mississippi. Jacob married Sarah Ann HOGG about 1798 in , , Georgia. Sarah Ann HOGG [Parents] was born in 1785 in , , North Carolina. She died in 1860 in , Madison, Mississippi. Sarah married Jacob HOLLINGSWORTH about 1798 in , , Georgia. M i Isaac HOLLINGSWORTH was born in 1800. He died in 1889. M ii John Joseph HOLLINGSWORTH "Sr" was born in 1802. He died in 1865. Isaac Shewin HOLLINGSWORTH [Parents] was born in 1780 in , Burke, North Carolina. He died on 12 Mar 1866 in Decatur, Newton, Mississippi. He was buried in 1866 in Decatur, Newton, Misissippi. Isaac married Dorcas SMITH in Apr 1803 in , Franklin, Georgia. Dorcas SMITH [Parents] was born in 1783 in , Franklin, Georgia. She died in 1826 in Fair River Community, Lincoln, Misssissippi. Dorcas married Isaac Shewin HOLLINGSWORTH in Apr 1803 in , Franklin, Georgia. F i Sarah "Sally" HOLLINGSWORTH was born on 18 Jun 1805. She died on 30 Jun 1865. M ii William Smith HOLLINGSWORTH was born on 25 Feb 1806. He died on 13 Jun 1852. F iii Mary Ann "Polly" HOLLINGSWORTH was born on 25 Feb 1806. She died on 25 Jul 1860. F iv Nancy HOLLINGSWORTH was born on 11 Jan 1808. She died in 1853. F v Elizabeth M. HOLLINGSWORTH was born in 1809. She died on 3 Dec 1878. M vi Isham Smith HOLLINGSWORTH was born on 3 Dec 1810. He died on 1 Nov 1879. M vii Samuel H. HOLLINGSWORTH was born on 6 May 1813. He died on 19 Jun 1888. M viii Robert S. "Robin" HOLLINGSWORTH was born on 29 Oct 1817. He died in 1892. F ix Jemima HOLLINGSWORTH was born about 1817. She died in 1850/1860. M x Jacob James "Jake" HOLLINGSWORTH was born about 1823. He died about 1849. M xi Addison H. HOLLINGSWORTH was born in 1826. He died on 24 Jan 1892. Sherman Randolph DEATHERAGE [Parents] was born on 17 Mar 1895 in Mountain Home, Baxter, Arkansas. He died on 3 Dec 1856 in Shawnee, Pottawatomie, Oklahoma. Sherman married Essie Irene BRAY about 1917. Essie Irene BRAY [Parents] was born on 25 Dec 1899 in Township 5, Chickawaw Nation, Indian Territory, Oklahoma. She died on 4 Dec 1979 in Shawnee, Pottawatomie, Oklahoma. Essie married Sherman Randolph DEATHERAGE about 1917. F i Georgia Lee DEATHERAGE was born on 28 Dec 1917. She died on 20 Aug 1991. Denver DEATHERAGE was born in 1919 in , , Oklahoma. He died in 1920 in , , Oklahoma. Marvin DEATHERAGE was born in 1920 in Jefferson City, Cole, Missouri. He died in 2009. M v Hubert Dowe DEATHERAGE was born on 25 Jul 1921. He died on 1 Feb 2004. Wayman Randolph DEATHERAGE was born about 1923 in Shawnee, Pottawatomie, Oklahoma. He died in 2009. F vii Dorothy Jean DEATHERAGE was born on 31 Jan 1924. She died on 13 Mar 2009. F viii Minola Noreen DEATHERAGE was born on 18 Mar 1927. She died on 7 Jun 1989. Robert STEEN [Parents] was born in 1773 in Great Broad, River, Union Dist, South Carolina. He died on 30 Jan 1837 in , Rankin, Mississippi. Robert married Malona HOLLINGSWORTH in , , Tennessee, or Mississippi. Malona HOLLINGSWORTH [Parents] was born in 1787 in , Fayette, North Carolina. She died on 22 Dec 1836 in Steen's Creek, Rankin, Mississippi. Malona married Robert STEEN in , , Tennessee, or Mississippi. F i Elizabeth C. STEEN was born about 1814. She died in 1860. F ii Sarah E. STEEN was born about 1816. She died in 1893. M iii Silas Lusk STEEN was born about 1817. He died in 1860. Emma Edna STEEN was born about 1818 in , Rankin, Mississippi. F v Agnes Lucretia STEEN was born on 23 Apr 1819. She died on 30 Dec 1886. John STEEN was born about 1820. F vii Dorcas Hollingsworth STEEN was born on 22 Apr 1822. She died on 7 Apr 1896. M viii Isaac Hollingsworth STEEN was born on 5 May 1826. He died on 20 Feb 1881. F ix Mary Jane STEEN was born about 1830. She died in 1851/1857. F x Serena or Cyrena Eleanor STEEN was born on 18 Nov 1833. She died on 22 May 1898. 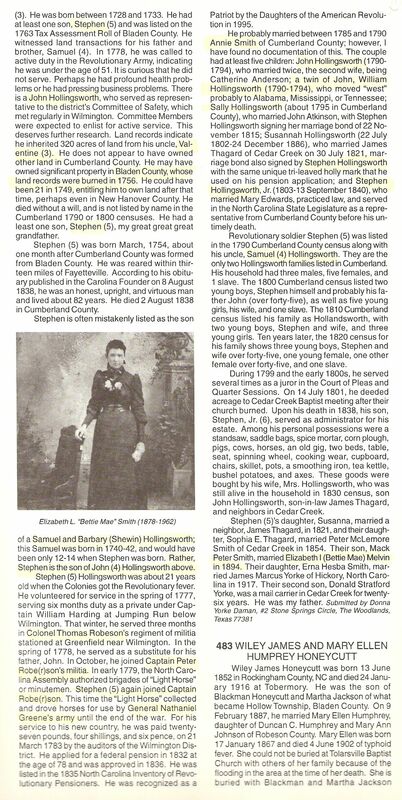 Stephen HOLLINGSWORTH "Sr" [Parents] was born in Mar 1754 in Near Fayettville, Bladen, North Carolina. He died on 2 Aug 1838 in Cedar Creek, Cumberland, North Carolina. Stephen married Annie SMITH about 1789. Annie SMITH was born in 1770 in Fayetteville, Cumberland, North Carolina. She died on 15 Nov 1838 in Cedar Creek, Cumberland, North Carolina. Annie married Stephen HOLLINGSWORTH "Sr" about 1789. M i John HOLLINGSWORTH was born on 3 Sep 1792. He died in 1840. M ii William H. HOLLINGSWORTH was born on 3 Sep 1794. He died about 1866. F iii Sarah "Sally" HOLLINGSWORTH was born in 1797. She died in Mar 1860. F iv Susannah T. “Susan” HOLLINGSWORTH was born on 22 Jul 1802. She died on 24 Dec 1886. M v Stephen HOLLINGSWORTH "Jr" was born in 1803. He died on 14 Sep 1840. Enoch HOLLINGSWORTH [Parents] was born in 1781 in , Burke, North Carolina. He died on 26 Sep 1814 in Fayette, North Carolina. Enoch married Margaret CUNNINGHAM on 1 Aug 1812 in , Haywood, North Carolina. Margaret CUNNINGHAM was born in 1786 in , York, South Carolina. She died about 1812 in , Haywood, North Carolina. Margaret married Enoch HOLLINGSWORTH on 1 Aug 1812 in , Haywood, North Carolina. William C. MC MINN [Parents] was born in 1840 in , Polk, Missouri. He died in 1910 in Possibly Stockton, Cedar, Missouri. William married Emma A. MC GEE on 28 Nov 1869. Emma A. MC GEE was born in , , California. She died in Maybe before 1910. Emma married William C. MC MINN on 28 Nov 1869. Commodore Perry MC MINN was born on 27 Mar 1873 in Geyserville, Sonoma, California. Levi Coulter FULBRIGHT [Parents] was born on 3 Feb 1811 in Waynesville, Haywood, North Carolina. He died on 14 Apr 1897 in , Laclede, Missouri. He was buried in , Laclede, Missouri. Levi married Nancy Emily HILLHOUSE. Nancy Emily HILLHOUSE was born in 1813 in , Giles, Tennessee. She died on 27 Jan 1903. Nancy married Levi Coulter FULBRIGHT. Samuel R. HOLLINGSWORTH [Parents] was born on 22 Sep 1798 in Along the Yadkin River, , Buncombe, North Carolina. He died in 1879 in Beardstown, Cass, Illinois. Samuel married Zilpha MAULDING on 22 Jun 1825 in , Hamilton, Illinois. Zilpha MAULDING [Parents] was born on 4 Jun 1800 in , Buncombe, North Carolina. She died on 24 Apr 1870 in Springfield, Greene, Missouri. Zilpha married Samuel R. HOLLINGSWORTH on 22 Jun 1825 in , Hamilton, Illinois. Wiley HOLLINGSWORTH was born in 1826 in Possibly, , Henry, Illinois. F ii Mary Ann "Polly" HOLLINGSWORTH was born in 1828. F iii Sarah HOLLINGSWORTH was born on 25 Dec 1830. She died in 1874. F iv Malinda HOLLINGSWORTH was born on 4 Nov 1832. She died on 2 Jan 1900. M v Enoch B. HOLLINGSWORTH was born on 17 Jan 1838. He died on 10 Mar 1878. F vii Arthura HOLLINGSWORTH was born on 30 May 1842. She died on 23 Mar 1878. Atcheson HOLLINGSWORTH was born in 1844 in Hickory Twp, Schuyler, Illinois. Laurel HOLLINGSWORTH was born on 1 Mar 1845 in Hickory Twp, Schuyler, Illinois. She died in 1888. F x Virginia "Jennie" HOLLINGSWORTH was born on 1 Mar 1845. She died on 19 Jan 1888. William T. HOLLINGSWORTH was born on 22 Oct 1847 in Hickory, Schuyler, Illinois. Leona HOLLINGSWORTH was born in 1852 in Hickory Twp, Schuyler, Illinois. F xiii Diora J. HOLLINGSWORTH was born on 22 Apr 1853. She died on 27 Mar 1883. Julian HOLLINGSWORTH was born in 1858 in Hickory Twp, Schuyler, Illinois.